If I had to summarize swampUP 2018 in one word, it would be “opportunity”. It was an opportunity to hear about the latest developments in DevOps and learn what the future holds from industry leaders in the biggest companies such as Google, Amazon, Microsoft and Netflix. It was an opportunity to share knowledge and experience with the community. It was an opportunity to network, make new customers and kick off new engagements. 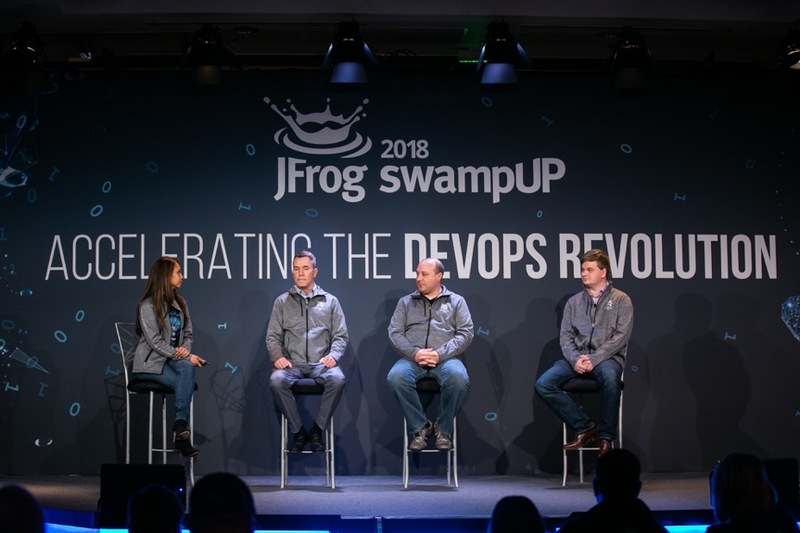 For us here at JFrog, It was an opportunity to meet our community face-to-face, share experiences working with our products and talk about the way forward. And all this opportunity happened, for the fourth time, in the wine-drenched hills of Napa Valley where we also managed to relax and have some fun. 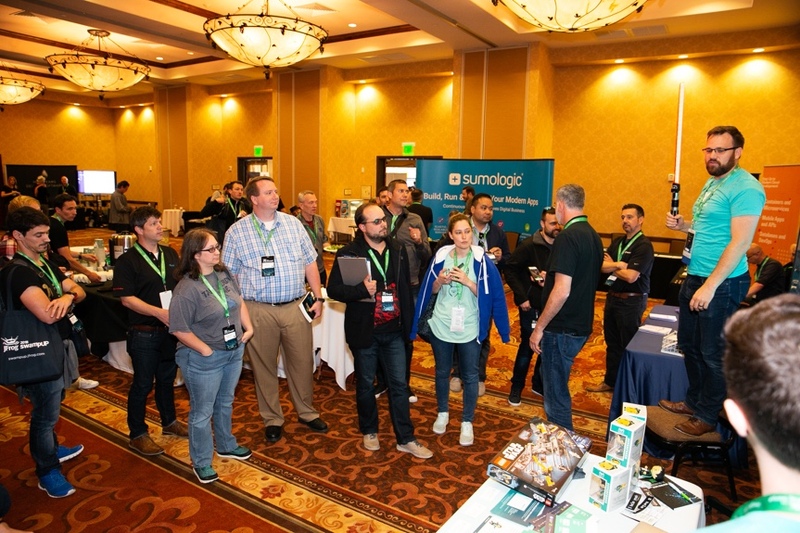 The first day of swampUP, the training day, was extremely popular, as always. 150 people attended 11 different sessions which were held in 7 tracks. JFrog senior technical staff provided talks that went deep into the details of all JFrog products. About half the time was fully “hands-on” where attendees got to tinker with live instances of Artifactory, Mission Control, Xray and Bintray. The busiest sessions were all around Artifactory and included “Advanced DevOps Automation”, “Monitoring and Troubleshooting” and “Advanced Security”, with “Best Practices in Robust Container Pipelines” also ranking high. The session on DevOps for C/C++ with Conan is especially noteworthy. With attendees crowding around the tables providing feedback for our roadmap and being fully engaged in the real live examples that were demonstrated, this session showed how this active and involved this community is with JFrog. The green dominating the pie charts of our satisfaction survey show how useful these sessions were to everyone. The ballroom at The Meritage was standing-room-only for every keynote this year. No wonder, with our lineup of industry rock stars talking about a variety of topics around DevOps, Cloud Computing, Serverless Architectures, Security and IoT. Melody Meckfessel and Sam Ramji showed how DevOps is used to bring ideas to production at Google; John Willis (Co-author of The DevOps Handbook) spoke about how Security is not adequately addressed in many DevOps organizations – a talk that had the audience both riveted to their seats and rolling with laughter; Arun Gupta enlightened us about serverless architectures at Amazon; Tomer Doron showed us how they take service frameworks to scale at Apple; and Kiran Bondalpati compared DevOps at a 30-person organization to an Uber-scale microservices model. Two separate, but related keynotes were especially exciting for us. 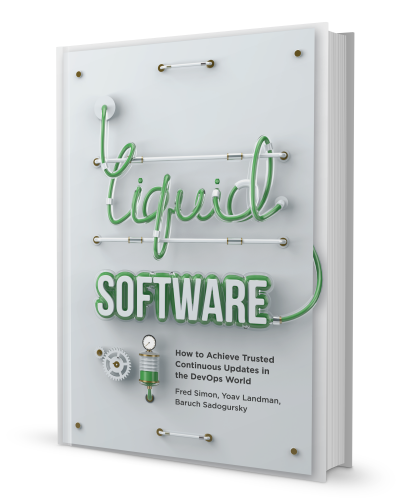 The first was our announcement about Liquid Software, the book, written and recently published by three of JFrog’s visionary, leadership, Fred Simon, Co-founder and Chief Architect; Yoav Landman, Co-founder and CTO; and Baruch Sadogursky, Head of Developer Relations. The book leans on the authors’ 50+ years of collective experience and talks about the current state and the future of DevOps as we move towards their vision for a software industry of continuous updates. The interest in the book by attendees was obvious from the long line of people waiting to get their copies personally signed by the authors. In a separate keynote, Kit Merker, VP of Business Development joined Dror Bereznitsky, VP Product Management and Loreli Cadapan, Senior Director of Product, to discuss the explosion of binaries, runtimes, devices and data as the world moves to microservices, cloud, and all those topics discussed in the other keynotes. The highlight of this talk was JFrog’s response to this evolution in the software industry – the JFrog Enterprise+ platform. Surprisingly, Murphy stayed away from this one, and Dror’s demo was smooth as silk showing how Enterprise+ is the answer to enterprises’ need for an end-to-end platform to manage secure continuous updates from developer fingertips to production systems at the compute edge. But the real proof of the value that Enterprise+ brings to the table was demonstrated when Loreli held an on-stage panel with CapitalOne, Fidelity and AlignTech, three of the participants in the six-week Enterprise+ beta program we conducted right before swampUP, who discussed their first experiences with Enterprise+ and how they might use it in the future. The response we got was explosive with many attendees making inquiries about Enterprise+ and several customer deployments already on the way. The breakout sessions is where we got up close and personal; intimate sessions where you could actually touch the speaker (yes, literally) and ask direct questions. At many sessions, once the speaker was done presenting, we saw people assemble and raise individual points about the session topic as it pertains to their specific domain. Connections were made, emails were exchanged and we know that many speakers will be following up with what are now potential customers. Not surprisingly, the hottest topics in the breakout sessions were around DevOps in general as well as Kubernetes and Helm integrated with different platforms and services (JFrog, Azure, Rancher and others). But there were also niche topics that drew attention, including Plex’s use case managing dependencies with Conan, and an introduction to Grafeas, the new artifact metadata standard and API introduced by Google and JFrog several months ago. A big THANK YOU to our sponsors, some of whom have been with us at every swampUP from the beginning. The sponsor expo was a magnet for visitors and got crowded in some of the breaks between sessions. The value to our sponsors of displaying at swampUP was clear. New customer opportunities were most significant, but also the feedback they got from attendees on their products and offers. But as customers and partners, our sponsors also appreciated the deep discussions on JFrog’s roadmap and strengthening the partnership with us through easy access to all JFrog senior executives. So swampUP is done and we are pushing forward along our DevOps pathway for 2018. 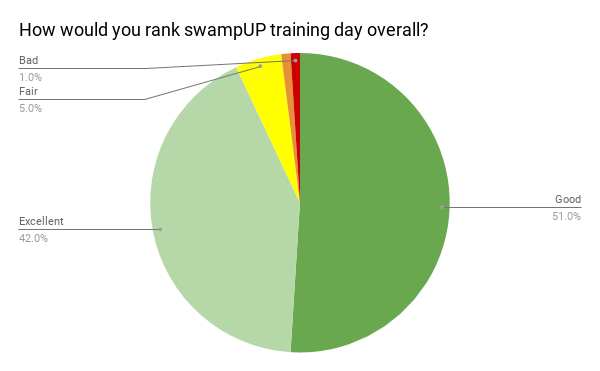 Keep your eyes peeled for swampUP 2019 announcements because we will keep raising the bar. Keynote and session videos will soon be available on the swampUP website. Stay tuned.